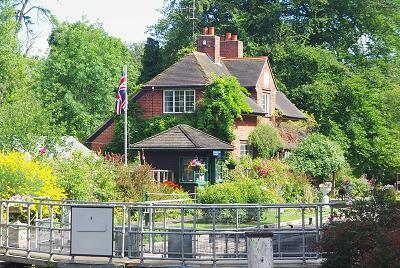 Sonning lock is one of the prettiest and best kept locks along the River Thames. The lock house is adorned with colourful window boxes and containers of bright flowers are everywhere. Very shortly after passing the lock I am off on one of my own small diversions. I turn right along a marked footpath and arrive at the beautiful flint-built church of St.Andrew. The church has been wondrously restored, and its walls stand out sharply from the surroundings. The churchyard is immaculately maintained, and each of the entrance gates to the church has a neat archway. The village was once possessed its own Bishop, the church being one of the cathedrals of the ancient Saxon diocese of Ramsbury and Sonning. 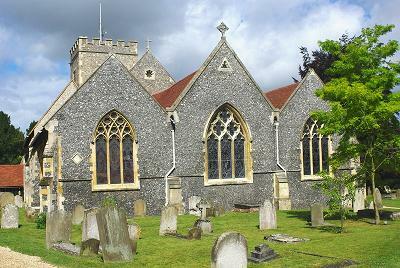 It later became the home of the Bishop of Salisbury. Conveniently adjacent to the church is the wonderful “Bull Inn” which boasts a very attractive courtyard and tabled terrace. The sun is by now well over the yardarm so it is time for a couple of refreshers and a sandwich. The village itself is a very attractive place. Narrow streets are lined with well-maintained old houses and it is a delight to wind my way back to the river bridge to rejoin the pathway. 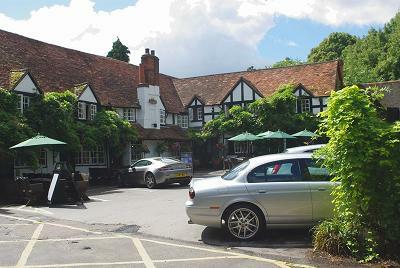 Sonning is a very ancient border village dating back to the earliest Saxon times. It used to mark the border between the ancient kingdoms of Wessex and Mercia, but now forms the dividing line between Berkshire and Oxfordshire. So specific is the boundary that there is a stone on the middle of the bridge marked with a vertical line to show the exact point where Berkshire changes to Oxfordshire. The bridge is a beautiful multi-arched brick structure built in 1775. It is hump-backed in profile with the central arch being the largest, and the other arches tapering away on either side. The setting between the tree-lined banks is idyllic and has inspired many artists over the years to reproduce its beauty in many paintings and prints. 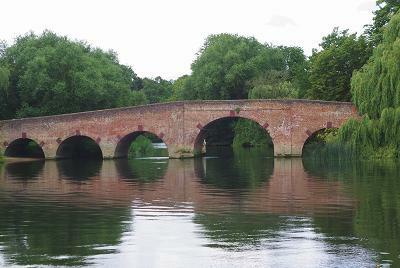 Sonning is the only bridge between Reading and Henley and consequently has a fairly heavy flow of traffic. There are traffic lights to control the vehicles, but pedestrians can cross over on the narrow footpath keeping tight to the wall. Having spent some considerable time on the south bank of the river it is time to return to the north bank where I shall remain until Henley. At the far end of the bridge there is an award-winning development. The old watermill has been completely renovated and converted into a theatre. Three mills are recorded at Sonning in the Domesday Book, so milling had been a feature here for a considerable time. 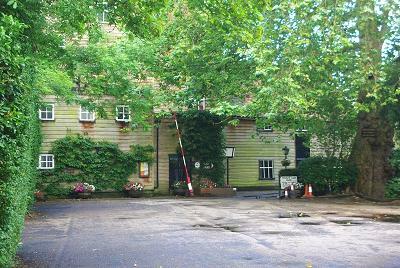 The Sonning mill expanded massively through the latter part of the nineteenth century and early twentieth century. However, even with all of the expansions to increase its output it eventually was no longer able to compete commercially with the massive new mill at Tilbury and it was closed down in 1969. The mill remained empty for several years, and was then purchased by Tim and Eileen Richards in 1977. Together with Tim’s brother Frank they converted the old mill into a dining theatre, which took them four years to complete. The mill now boasts an award-winning 215 seat air-conditioned theatre with a restaurant. The towpath continues across more meadows until the high ground of Shiplake starts to grow ahead of me. 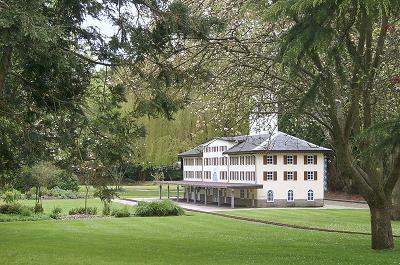 The pathway passes in front of the Shiplake College boathouse and carries on to Shiplake Lock. Here the towpath takes another of its annoying trips to the opposite bank, and the Thames Path cuts inland through Lower Shiplake. In order to return to the river, the pathway follows a track behind some more VNH’s. Towards the end of the track one of the houses has a full miniature railway in its back garden, complete with its own little station. Unfortunately the owner is not playing with his pride and joy today so I continue onwards to the river, and a return to meadow land.